At a recent national convention on ADHD, one speaker suggested "good science" argues that ADHD is entirely a pathological condition, a genetic illness, and that there is no value whatsoever in a person "having ADHD." Anybody who may seek to offer hope to ADHD children or parents was accused of telling "stories," the citation again being "good science." The speaker suggested that ADHD is purely a genetic defect; the neo-Darwinist theory being that sometimes genetic problems are simply "weaknesses in the evolution..." and that, "qualities of ADHD place individuals at the lower tail of an adaptive bell curve...."
If this is true, then perhaps we should all just throw up our hands and put ourselves in the care of the pharmaceutical industry, which has been more than generous to many who put forth the above assertion. If not, then the very word "science" itself is being twisted in a dangerous way, reminiscent of how the Eugenicists and Germans used "science" earlier in this century to justify "correcting genetic deficiencies" in the human race. True "good science" understands three primary ways a researcher can devise a study to prove pretty much whatever he wants. These methods involve what are called "sample bias"; "experimenter bias" (or "experimenter effect," or "the Heisenberg Principle"); and "model bias" or defects in the actual structure of the experiment itself or the conclusions drawn from it. Let's take a very quick look at how badly most of the supposed "good science" that calls itself "research" into ADHD has been contaminated by these various problems. If we wanted to find out what type of people were generally driving cars in, say, New York City, an easy way to do the study would be to approach the New York Police Department. "Let us put a psychologist in the back seat of every police car for two weeks," we could ask, "and whenever the cop stops somebody or arrests somebody, our psychologist will jump out with a clipboard and pen and interview the subject, taking detailed notes." What would we find? To the no-doubt horror of people living in New York (and the delight of those in Los Angeles), we could "scientifically prove" that virtually all New York drivers studied had committed some sort of crime, these ranging from minor traffic infractions to murder. More than eighty percent were at risk for jail time if they didn't appear in court or pay a fine within a few weeks. Ninety percent had bad or sullen attitudes. Fully fifteen times the population of "normal drivers" (not stopped by the police) were engaged in some sort of active criminal behavior, such as speeding away from a bank robbery or carrying drugs or fleeing the scent of a crime. The picture would be grim, indeed, because the entire study had been done from the back seat of police cars. Similarly, many of the studies of ADHD individuals have been done from the back seat (metaphorically) of mental institutions; the back seats of the offices of psychiatrists, psychologists, or psychotherapists; the back seats of the youth criminal justice system; or the back seats of counselor's or special education teacher's offices. Those identified to participate in the study in the first place were those who were already crashing and burning, already in crisis, already identified by themselves or somebody else as a person with a problem. This is sample bias at its worst, and if it weren't so tragic that people take them seriously, many of these purported "studies" of ADHD individuals would be laughable. David Reilly, M.D., reports on a study done at the University of Glasgow, Scotland, from 1987 to 1990. During this study, a group of asthma patients were given "a new asthma drug" over a period of several months. The patients thought they were getting medications at all times (although realized they were participating in some sort of medical study). The first month the doctors gave the pills, they (the doctors) thought there was a fifty percent chance the pills they were passing out contained some sort of drug, and a fifty percent chance they were handing out placebos (sugar pills), although the doctors themselves didn't know which was which or who was getting which. The reactions from the patients varied, but were not dramatic. The next few weeks, the doctors were told that all of the pills they were passing out contained drugs. The responses of the patients were so sudden and so dramatic that one claimed to be cured of his asthma, whereas another had such a severe and life-threatening asthma attack within minutes of administration of the drug that he threatened to sue the hospital and university supervising the study for giving him such a dangerous experimental drug. Interestingly, there were never any drugs involved in the study whatsoever: at all times, the pills passed out were placebos. But when the doctors were certain that all of the pills they were passing out were drugs, the patients began to react much more strongly to the sugar pills than they had when the doctors were unsure about whether the pills contained drugs or were merely placebos. A similarly dramatic study was published in the British medical Journal Lancet in 1985 by Gracley, Dubner, Deeter, and Wolksee. Titled, "Clinicians' expectations influence placebo analgesia," this study found that when doctors thought they were giving out powerful pain drugs (to people really in severe pain) the patients' pain usually dropped, sometimes even more dramatically than under morphine. On the other hand, when doctors gave real painkillers but thought they were passing out sugar pills, patients' pain often wasn't significantly diminished, even though the painkillers were among the most powerful in existence. Over the years, many similar studies have been done, always with similar results, and have been printed in publications ranging from The Journal of the American Medical Association to the British Medical Journal to Psychoneuroimmunology to Clinical Psychology Reviews. In the field of education, numerous similar studies show the power of experimenters' or patients' expectations. Classics include studies where teachers are told they have bright or slow students and the students perform to the teacher's expectations, or the famous classroom experiment where children were told that blue eyes indicated higher intelligence or status and brown eyes lower, and within days the children had socially reorganized themselves. In physics, this is referred to as The Heisenberg Principle: the observer will always have some effect on the experiment, and the mere act of being observed alters the way things are, thus changing the outcome of the study. At least in physics, scientists understand this: some "scientists" appear to have missed that week of science class, or perhaps never studied the scientific method at all. Thus, we have studies where children are "identified" at an early age as having a "disorder" and being "deficient." They, or their parents, or their teachers, or all, are told of the child's "deficit." And then these children are "observed" over time to determine their "outcome." If such research weren't so destructive, it would be comedic. The sad fact is that if a control group of "normal" children were to be introduced to the study, and these fully "normal" children were told they had a brain "deficit" that was a psychological "disorder," and their parents and teachers were similarly informed, and they were then observed for a number of years, the damage that would be done to the "normal" children by this change in their self-story is so obvious and predictable that the experimenters could find themselves in jail for child abuse. Certainly such a study of "normal" children would never pass a research review board...yet we routinely inflict this on "disordered" children. This area is the most pernicious and destructive of all among the so-called "scientific" studies of ADHD children, precisely because it's so transparent that most people never even realize it's present. The basis of virtually all of the arguments put forward that ADHD is purely a defect rest on research done among public schoolchildren in the United States, or of adults who were students of American public schools. While education for the first six thousand years of our civilization was most often a mentorship and interactive process, in the past 170 years it's become something that even University of Virginia founder Thomas Jefferson would not recognize. For example, in the early years of education teachers were expected to develop personal relationships with their students. If you were a student of Rembrandt, you got to know him and he got to know you. Or Hippocrates, or Pasteur, or Leonardo da Vinci. Even today, this is the primary model of graduate school, particularly when people are working on their Ph.D. or the latter years of their M.D. degrees. Second, in the 1880's, a Cambridge instructor named William Farish earned the distinction of being the world's first and most famous lazy (or profitable) teacher. The industrial revolution was well under way by this time, and Cambridge was experimenting with the idea of paying teachers piece-rate (per student) instead of salaries. It increased the productivity of factory workers, went the idea, so may increase the productivity of teachers as well. But Farish was also stuck in a six-thousand-year-old system of education where teachers were expected to get to know their students well enough to know if the students understood the material being taught. That took time and work. There had to be a way, Farish reasoned, to turn children from pupils and students into items on an assembly line. If they could be somehow organized into "learned" and "hasn't yet learned" categories by an objective measure, then Farish wouldn't have to take the time to get to know them. And so he invented grades. The invention of grades and standardized testing by Farish in the 1880s so increased his income (he could "teach" nearly three times as many students, so his piece-rate pay skyrocketed) that other teachers stampeded to follow. Grades became a major fad in England, moving to the United States by the turn of the century and becoming firmly entrenched by the 1920's. Thomas Jefferson, educated in the 1700's, never had to raise his hand and never took a test to determine his grade. Between these two major changes - the sit-down-shut-up-raise-your-hand-to-speak German invention and the measurement-of-knowledge-with-paper-and-pen-instead-of-by-another- person-getting-to-know-you - schools were transformed from the Jeffersonian ideal of a theatre of ideas and interaction into the Henry Ford ideal of an assembly line. And, as with Ford's factories, any product on the assembly line that wasn't "Grade A Standard" had to be pushed off the conveyor belt and dumped into the trash bin, or else rebuilt by a different group of workers whose job was to repair "defective goods." Many people alive today remember the fate of left-handed children in many schools earlier in this century. In my father's time, many left-handed children literally had their left arms tied to their bodies during the first few years of school so they could learn to write "properly" with their right hands. They were, of course, suffering from what was believed to be a defect of brain wiring: left-handed disorder. I remember a friend, now in his late 70's, telling me with tears in his eyes what a humiliating and painful experience it was to be so segregated from his peers, what a struggle it was to try to cut paper for art class or learn good penmanship, and how he was labeled a "slow learner" because he was focusing so much of his energy on trying to use his right hand. While it's obvious to us all what a wounding experience not fitting into those schools left-handers had, most miss entirely how painful it is for ADHD children in today's public schools. The brains of ADHD children are not wired to be good items for an assembly line, and they don't fit into the factories that our schools have become. So should it surprise anybody that a study of them would find that in these factory schools they don't perform as well as their "normal" peers? Again, the experiments are so pathetically designed that it's astounding anybody would dare call them "science." The "control groups" are "normal" students - those whose brains are wired in a way that allows them to sit on the assembly line for 12 or more years with no problem at all. The researchers say they're measuring the abilities of one group of students against another, that there is only one major factor being tested. How sadly naive. What's really being measured is the school, not the students. What's being demonstrated by this so-called "good science" is that our public schools will work fine for one group of kids, but will wound another group of kids (those we call ADHD) so badly that they'll end up at risk for drug abuse, develop attitudinal and self-esteem problems, and spin into a free-fall of dysregulation and despair. If the "control groups" in these studies were ADHD students in private school environments, or homeschooling ADHD kids - who were never wounded by public school, even in their early years - then the results would be much different. As psychologist and former psychology professor Dr. Stephen Larsen points out from the experience of his own two children, "Public schools wound kids who are not what we call 'average,' and that wounding can be severe and lifelong. Get those kids out of public schools and into a true learning environment and they will outperform any norm you can measure them against." Ask any parent whose gone through the process, who's watched the wounding of their child because he wasn't a "standardized product" for the factory of "standardized education" and then seem him blossom in a private school, charter school, or homeschooling environment, and you'll hear the same story: ADHD children can succeed. And when their childhood self-esteem isn't destroyed by so-called "experts" telling them that because they're not just like every other car on the assembly line they have a "deficit" and a "disorder," it turns out it is possible that these ADHD children can grow up to be highly functional and successful adults. Far from showing America has an army of genetically defective children, "good science" has proven that we have a severely dysfunctional educational system. Between one and three million children in the United States alone must daily take psychoactive drugs ranging from stimulants to antidepressants just to rewire their brains enough that they can stay on the conveyor belt. The system is broken, and out of that brokenness has come an army of so-called experts who perform what they call "research" on these children to prove their "defects," and a billion-dollar "therapeutic" industry supplying the children wounded by our dysfunctional schools with diagnosis, therapy, special education, and drugs. We must confront a difficult question. When my son couldn't succeed in a public school without taking drugs because he had a "disorder" called ADHD, yet this same child jumped two full grade levels in a single year without medications in a private school where children didn't have to raise their hands and emphasis was on mentoring and teaching instead of testing, I realized I'd been asking the wrong question. It wasn't, "What's wrong with my son?" Instead, if the disorder existed when he was in the public school, but vanished in the private school, then where was the disorder? Concluding the disorder was in the school and not the child, we homeschooled his younger sister for her high school years, and this "bad student" completed four years of schooling in two years, never working more than two hours a day, and began college at the age of sixteen. She, too, had been told she had a disorder, and again I had to ask myself, "Where is the real disorder?" I believe it's critically important that we all ask our "scientists" and ourselves the same question. Then we can get on with taking education back to the model that worked so well for six thousand years, but has recently been twisted into a destructive and wounding machine by the belief that cars on assembly lines and children in schools are essentially the same thing. 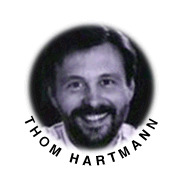 Thom Hartmann is the author of six books on ADD, including Attention Deficit Disorder, A Different Perception, Healing ADD: Simple Exercises that will change your Daily Life, ADD success Stories: A Guide to fulfillment for Families with Attention Deficit Disorder. He is the former executive director of a residential treatment facility for emotionally disturbed children, the co-founder of a school for ADHD children, a psychotherapist and one of America's most popular radio hosts.